This is an old revision of this page, as edited by muses-success at 06:35, 13 November 2010. It may differ significantly from the current revision. "A real-time blog of the end of the world"
The Apocalypse Blog has not been tagged yet. Help others find The Apocalypse Blog by tagging it! 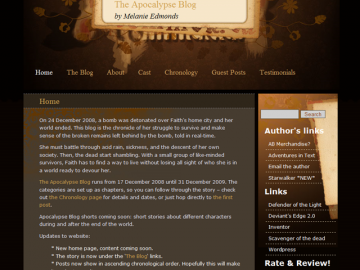 The Apocalypse Blog has not been reviewed yet. The Apocalypse Blog has not been recommended yet.